Now swimming will be extra fu all thanks to this Girls PAW Patrol Swimsuit. 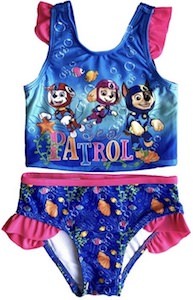 The PAW Patrol bathing suit comes in a bunch of toddler sizes and it is made from 85% polyester and 15% spandex and also offers and SPF 50 protection. The swimsuit has little swim bottoms that are blue with some pink edges on the side and little fish and shells and other sea things printed on it. And then the bikini top is blue because of the sea too and there are 3 puppies swimming in it and those are Marshall, Skye, and Chase and they seem to be loving the swimming. 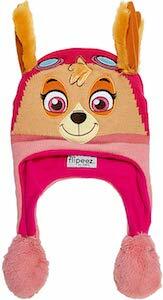 I am sure that your child will love to wear this swimsuit to the pool or beach. 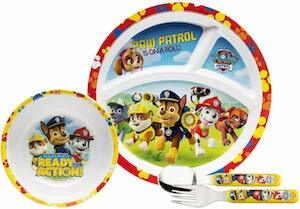 Now it is time for dinner and it will be so much better with this Kids PAW Patrol Dinner Set. The set is all decorated with many of the PAW Patrol puppies and the logo too. Included you can find and 8 inch divided plate and a 5 inch bowl and a fork and a spoon so that should be enough for a meal and a fun bowl that is included is great for soup but even better for desert. The PAW Patrol flatware kit is 100% BPA free and is dishwasher safe but can not be in microwave. Writing about the PAW Patrol set makes me really hungry and I am sure you kids will be to when they see this set. 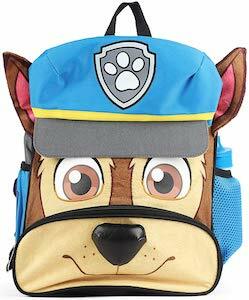 Paw Patrol has many characters all who are ready to help out and save the day. If you love Marshall the dog who is a firefighter the you will need to check out this ultimate rescue fire truck. This fire truck comes complete with everything you need to fight a fire, the truck has a two foot extendable ladder, roll out mini cart and you can open up the lookout cab to move the working claw arm. You will also get the Marshall figure and the fire truck comes with working water cannon to launch up to three water cannons. 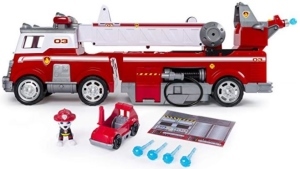 Combine this ultimate rescue fire truck with other Paw Patrol figures and have loads of fun helping out to save the day. What a perfect gift for Christmas, birthdays or any occasion. Now Kids can do yoga thanks to this PAW Patrol Chase yoga mat. 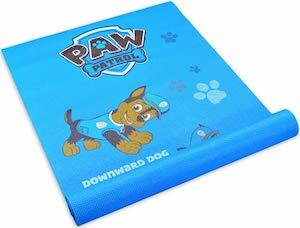 The blue yoga mat is made for kids that love PAW Patrol but adults can use it to. On the yoga mat you can find some paw prints in the background and on top you can find the PAW Patrol logo and Chase doing all kind of yoga moves including downward dog as this puppy is really good at that. The PAW Patrol yoga mat is about the same size as an adult yoga mat and it is made from high density foam so that your child can really do yoga or just play on the fun mat. 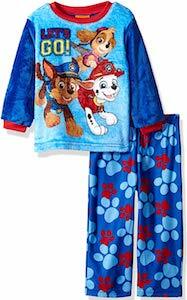 If your toddler needs a fun new pajama then check out this toddler PAW Patrol pajama. The kids pajama has blue pajama pants with on it in red and light blue the paw prints of dogs and then there is the pajama top that is light blue with dark blue sleeves and on the front you find Skye, Marshall, and Chase and they are ready to go. 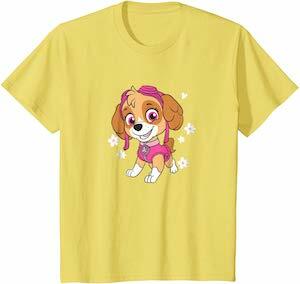 The PAW Patrol pajama shirt is soft almost like dogs fur and the whole puppy sleepwear is made from 100% polyester and it comes in sizes T2, T3, T4. 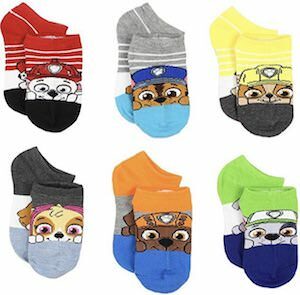 Now your little one is ready to wear the pajamas all thanks to the puppies from PAW Patrol and they will be warm and comfy while sleeping and playing around the house. If your child loves to blow bubbles but it often ends up with bubble solution everywhere then you have to check out this spill proof PAW Patrol bubble bucket. 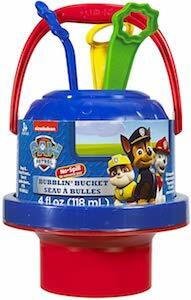 The bubble bucket is red and blue and it has PAW Patrol pups on the outside and it also has the PAW Patrol logo. The bucket is spill proof making it just perfect because now the bubble solution is going to last a lot longer. The PAW Patrol bucket comes with 3 bubble wands and bubble solution so that your child can start making bubbles fly as soon as they get this fun outdoor toy.